In the summer of 2000, the Cleveland Indians had a lineup to be reckoned with. By season’s end, they’d pounded out 950 runs, second-most in the American League during one of the AL’s highest-scoring post-war seasons. And that came on the heels of Cleveland’s 1999 campaign, when it became only the seventh team since 1901 to score 1,000 runs in a single season. Between Manny Ramirez, Jim Thome, Roberto Alomar, Kenny Lofton and David Justice, few teams in history have boasted as much offensive firepower as those Indians did. But on June 8, 2000, Cleveland’s powerful batters looked like a bunch of grade-schoolers facing the hard-throwing kid who was held back a year, reduced to scrounging for baserunners and hoping to string together a few lucky hits. Pedro Martinez was on the mound, and that meant opposing hitters didn’t stand a chance. Against Cleveland, Martinez pitched eight innings of one-hit, shutout ball, striking out 10 batters and walking only one. It wasn’t even his best outing of the season to that point — on May 12, he’d struck out 15 Orioles, and walked none, in a complete-game shutout — but it was a classic example of how unhittable Martinez was in his prime. When Hall of Famer Roberto Alomar reached base in the first (on a throwing error by the catcher after Alomar tapped a weak dribbler in front of home plate), he was Cleveland’s sole baserunner until late in the 5th inning. In six separate innings, Martinez set down the Indians in order, 1-2-3. As if to add emphasis, he capped off four of those perfect frames with a strikeout to retire the side. When Martinez made his debut in 1992, Boston’s Roger Clemens had the highest Pitcher Score of any active player in baseball. A few years earlier, Clemens had even briefly come within striking distance of the all-time leader — the underappreciated Dazzy Vance, who peaked four starts into his 1929 season and had never been surpassed in the more than six decades since — and he was still pitching at one of the highest levels any starter had ever attained. 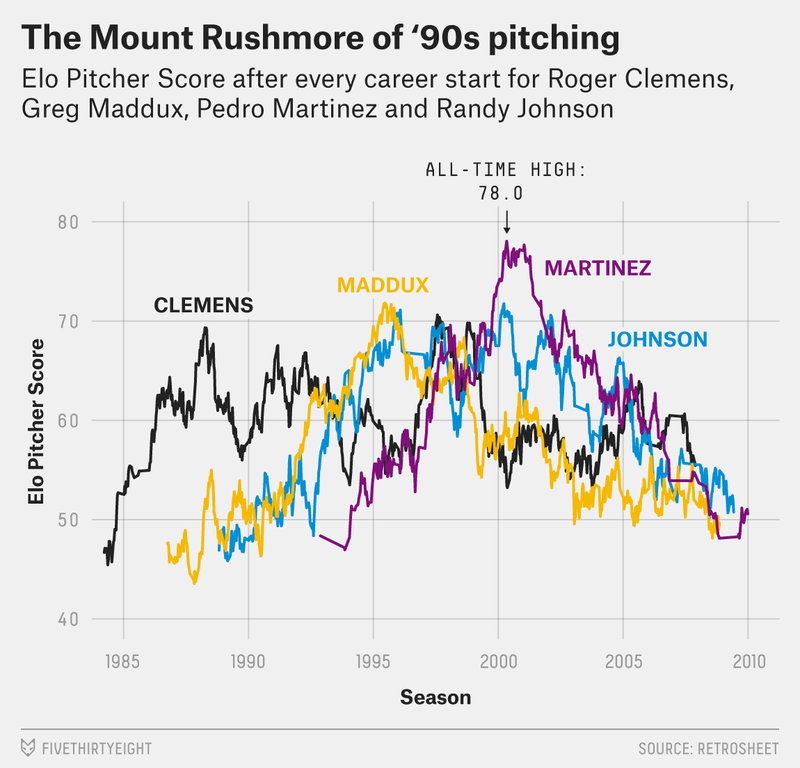 But by the mid-’90s it became clear that Martinez would need to climb over more than just Clemens and Vance to reach the all-time pitching summit. In 1994, Atlanta’s Greg Maddux staged an all-out assault on big-league batters. At the time of the season-ending players’ strike, Maddux had a microscopic 1.56 ERA, the lowest WHIP in the majors by a mile — and he was within decimal points of becoming the new all-time leader in Pitcher Score. Finally, after Maddux allowed only one run to the Houston Astros in eight innings on June 3, 1995, baseball had a new Greatest Starting Pitcher Ever™ (according to our stat). But Maddux’s reign at the top of the pitcher rankings was short-lived — Seattle’s Randy Johnson, who had the best strikeout-to-walk differential of the expansion era that year, also passed Vance, and then Maddux, before season’s end. Over the next few seasons, Maddux and Johnson would jockey for position atop the Pitcher Score rankings. Meanwhile, Martinez slowly built his résumé in the background, cracking the top 25 in 1995 and the top 16 by 1996. Then, in 1997, Pedro made a major breakthrough, posting a 1.90 ERA and finishing the season as the third-best pitcher in the game, according to Pitcher Score. At the same time, Clemens bounced back from a handful of comparatively down seasons to make his own run at Maddux and Johnson. Baseball suddenly had a quartet of all-time great starters operating at or near the peak level of any pitchers who’d ever played the game. Against that backdrop, Martinez kept edging closer to the top of the Pitcher Score leaderboard, spending most of the 1998 season cruising in second place behind Clemens. But in 1999, his performance took yet another huge leap — and he embarked on the most dominant stretch of pitching the sport has ever known. On Sept. 21, 1999, after shutting out the Toronto Blue Jays, with his ERA sitting at 2.11 in a league where average was 4.86, Martinez had done it: He’d broken Maddux’s record, establishing a new historical high-water mark for Pitcher Score greatness. Somehow, Pedro was just getting started. In 1999, he’d shown the best pure stuff in baseball history — the lowest fielding-independent pitching numbers ever, before we even knew that fielding-independent pitching was important (or even, you know, a thing). In 2000, he would couple another great FIP with a high rate of outs on balls in play to generate the lowest ERA (relative to the league) of anybody, ever. The two seasons are so ridiculously good that there are actual Internet arguments over which campaign was better, with the answer pretty much determining whether you grab your wins above replacement from Baseball-Reference or from FanGraphs. This year’s crop of starting pitchers is pretty amazing, between the ongoing dominance of such hurlers as Clayton Kershaw and Jake Arrieta, and performances like the one Max Scherzer put together Wednesday night. But even at their best, no current pitcher is within 10 Pitcher Score points of Martinez’s peak mark. The top-ranked Arrieta, for instance, would need a breakthrough like the one Martinez made between 1998 and 1999, in order to start making real progress toward Pedro’s all-time record. It’s yet another piece of context that puts Martinez’s best years in perspective — and helps us appreciate the staggering heights to which he pushed the bar for starting-pitcher greatness. 1911 is the earliest season for which we have the data to compute Game Scores for starting pitching performances in every game. Not including 2016 thus far. Our exact game score formula (47.4 + 1.5*outs + strikeouts – 2*walks – 2*hits – 3*runs – 4*homeruns) differs slightly from Bill James’ original version, but both metrics are constructed in the same spirit.